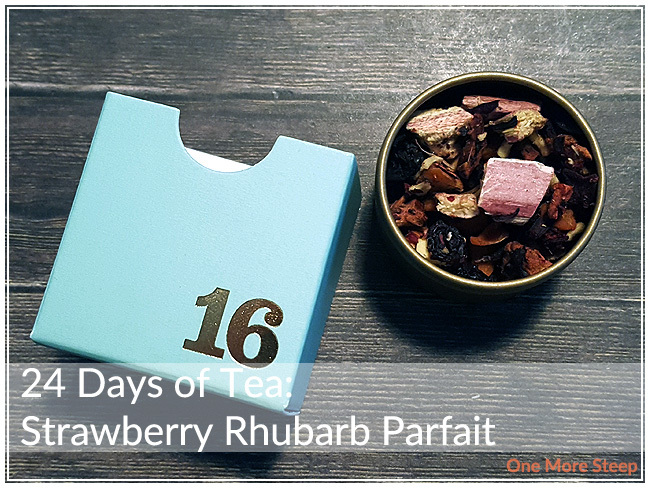 I was excited to see Strawberry Rhubarb Parfait as the tea of the day for day 16 of the 24 Days of Tea advent calendar because it’s one of those teas that I’ve always wanted to try, but hadn’t gotten around to buying just yet. There’s this amazingly sweet and fruity smell to this tea that mingles well with the natural tartness of the rhubarb that I can make out. It essentially smells like strawberry rhubarb pie filling, which I think is just delicious. Strawberry Rhubarb Parfait is made up out: apple, hibiscus, raisins, carrot, yoghurt bits, beetroot, strawberry, rhubarb, and natural and artificial flavouring. DavidsTea recommends steeping Strawberry Rhubarb Parfait in near-boiling water (90-95°C/194-203°F) for 4 to 7 minutes. I wound up steeping the entire tin’s worth of tea for 5 minutes. Strawberry Rhubarb Parfait does not disappoint in the colour department as it steeps to a beautiful deep pink. 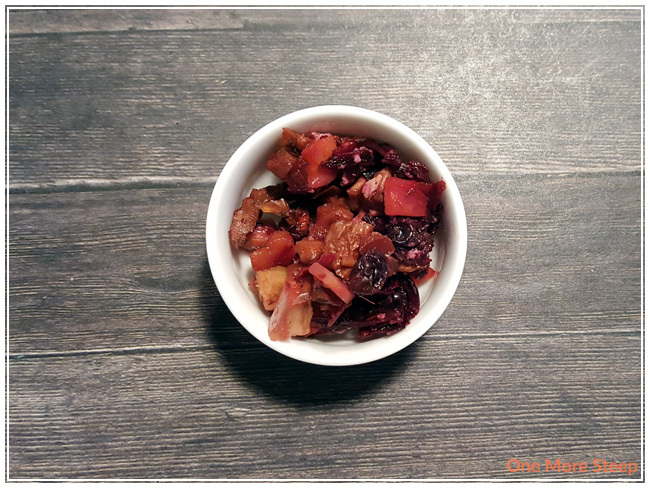 There’s a nice natural sweetness to the tea that is well balanced with the tartness from the hibiscus and the rhubarb. 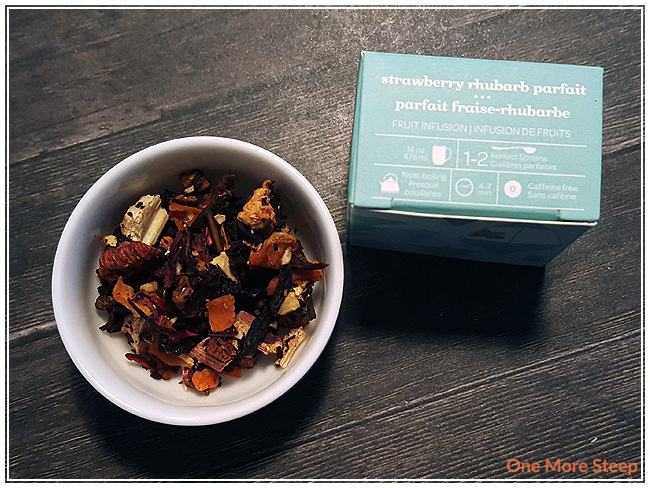 The flavours of strawberry and rhubarb are both well represented in this tea, and it tastes exactly like one would expect with the name of the blend. It’s quite enjoyable. Because Strawberry Rhubarb Parfait is so fruity, I think it would make an excellent iced tea or tea pop candidate. I wound up putting some ice cubes into my cup and I’m pleased to say that it makes a great iced tea. If it’s a bit too tart for you, I would add some sweetener to it prior to cooling it down (honey or agave would be a great choice!). I don’t resteep herbal or fruit infusions, so I did not resteep Strawberry Rhubarb Parfait. I loved DavidsTea’s Strawberry Rhubarb Parfait. I can definitely see why it’s considered a Fan Favourite out of their whole tea collection. I greatly appreciate the fact that the smell of tea before and after steeping is very similar, and it tastes as expected. It has a great flavour to it, the tartness leads to some mouth puckering that isn’t unpleasant. 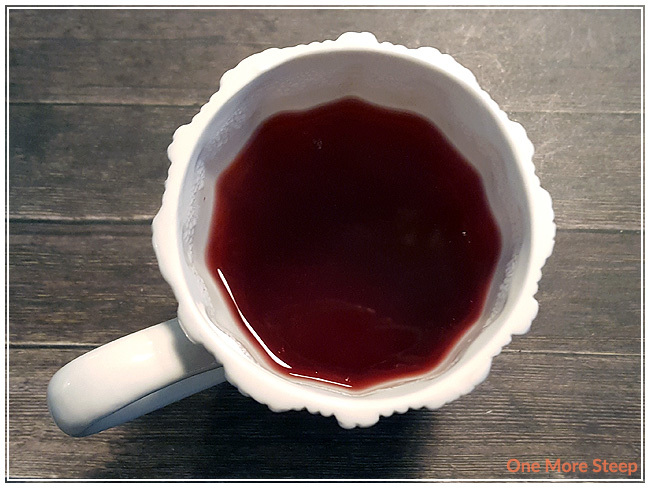 This is definitely a blend that would be best suited as an iced tea or a tea pop, but it is still good as a hot cup of tea. I think that Strawberry Rhubarb Parfait would be good year-round, and I may need to get my hands on some more now that my tin is emptied.